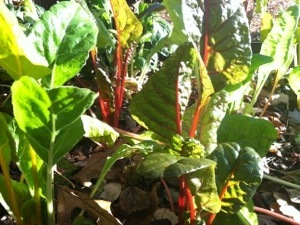 We’ll be harvesting some of our own Swiss chard for dinner this week! The holidays are almost upon us and while I am not at all ready, I am sprinting to the finish line of 2012. Later this week I will post some of our traditional holiday recipes and how we are using local ingredients to improve our standard Christmas Eve and Christmas menus. As for this week, we are keeping it simple and trying to have fun in this last rush before Santa arrives. We are at zero hour here in NC. Two days of blissfully wonderful, spring-like weather and starting tomorrow temperatures are predicted to be over 100 degrees for the remainder of the week and weekend. If you have lived in the South, you know what that means–you can’t walk, talk or move without coating yourself in a sheen of humidity and sweat. Makeup? No way, Jose. Those cute little “summer sweaters”? Put ’em up or pack them in a suitcase and head to Maine. Like manic people before a snowstorm, everyone is scrambling around to get their “outdoor errands” done before tomorrow. And for me, that means grocery shopping. Taking advantage of the lovely weather, I headed out to the Downtown Raleigh Farmer’s Market to finish my shopping for the week. I managed to get everything done on my lunch hour while the temperature was still in the low 80s. I’m planning to make some peach chutney, so I was especially interested in peaches and some jalapeno peppers (since the voles so kindly ate the roots of my plants). I also stocked up on raspberries because their season is just about over. Will make more jam tonight! What’s fresh in central NC? Here’s a list of what I found! 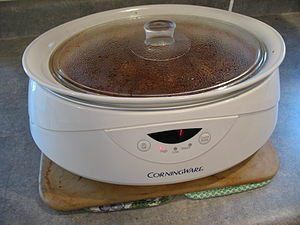 Since our pork roast never made it out of the freezer in time for Sunday supper, I have changed my mind and we are having it as a crock pot barbecue, pulled pork dinner instead. My family won’t be around for Tuesday dinner, so I’m on my own–abandoned for math tutoring and softball. This means either scrambled eggs or oatmeal instead of whatever the heck I had planned. This week has been so chaotic I don’t even remember anymore. Here’s the deal though. Whatever I have in the refrigerator or pantry is most likely local, healthy and delicious. So, even if we are three individuals left on our own to scrounge up something for supper this week, whatever it is will not be bad for us and it will certainly be better than anything fast food. This is one week where I am glad to have a freezer full of put up food and a crock pot full of Homestead Farm pork shoulder. The pork quesadillas may end up as burritos eaten on the run or maybe we will all eat cereal and freeze the barbecue, but we’ll all get fed and we’ll all get through this week. Thank goodness for freezers, for farmers and for upcoming holiday weekends! 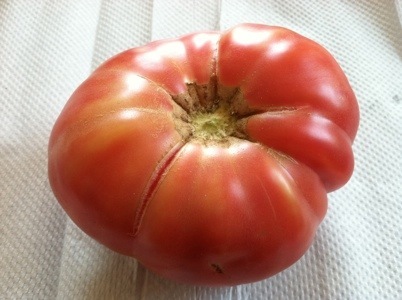 Worlds can be rocked by a single, ripe tomato. The transformative nature of fresh tomatoes is the start of a wonderful documentary by two New York 11year olds titled “What’s On Your Plate?”. The documentary starts with two middle school girls on vacation wondering why their farm fresh tomato tastes so much better than the tomatoes they buy in their local neighborhood market in New York City. Their journey takes them to farms, farmer’s markets, their school cafeteria, and their local grocery wondering where their food comes from, how it impacts their bodies, why access to fresh food is not equal across all neighborhoods and lastly, what the heck is a funion. I went to the screening with my family and some of our scout troop expecting a nice and probably quirky documentary. I did not expect the level of depth, analysis and research present in the film. To say I was impressed is an understatement. These two girls (and the people who helped them) did a wonderful job of taking a complex topic like our food production system and breaking it down into understandable, but still thoughtful segments. The screening was sponsored by Advocates for Health in Action and the Town of Cary. Thanks to them for making this resource available! Even better, the What’s On Your Plate Project website has games, activities and now there is even a book to help families keep learning! You can also watch a 10 minute piece of the film. This is highly recommended watching! I can’t believe we are beginning the third month of our family locavore challenge! This year seems to be speeding by–this is probably helped by our exceptionally warm weather. We were fortunate to start our journey during what we we call “The Year Without a Winter.” Our farmers have had an extended growing season, and I haven’t had a week yet, when I left the market empty-handed or disappointed (well, except for the “Broccoli Incident”). Eating locally in NC is not difficult, but it does require an adjustment of behaviors. I like having a social friendship with our farmers and meat producers. Local, organic produce tastes so much better, we feel like we are being spoiled. We have been on budget–or close–for most weeks in our challenge so far. We will never go back to buying store eggs. Fresh food, cooked creatively is so good that we have dramatically cut down the number of times we go out to eat. Our food tastes better, so why look elsewhere? Depsite not finding broccoli this week, I did find some beautiful swiss chard at the Western Wake Farmer’s Market. I love chard–it has such a fresh, light flavor that is a welcome respite from our kale and collard diet over the last few months. Lettuce and spring onions are out and other spring veggies are right around the corner! We are very excited that all of our area farmer’s markets crank up In 2 weeks and our Produce Box delivery starts soon as well! Our total spent is $98.39! Just a hair under our budget of $100. I actually feel pretty good about this because we are eating a lot of fresh seafood and salads, which fit in perfectly with our 85 degree days! The only red meat we are eating this week are grilled lamb burgers, so that should shake things up a bit! Thank you for reading our blog and for being a part of our journey. We have learned a lot about our community and ourselves and it just gets better as we go along! Day 33–Are You Joining a CSA? Today is 70 degrees and definitely doesn’t feel like February. But here we are in winter, dreaming of all the wonderful fruits and vegetables yet to come in the next few months. For CSA (community-supported agriculture) organizations, this is the end of the sign up season. We have just renewed our membership in The Produce Box, which is a modified version of a CSA. I love the concept of the CSA, but the pickup idea just wasn’t working for our schedules (or my memory). Wondering about getting your local veggies this spring and summer? Here are some good options. CSAs are membership “clubs” typically organized between a farmer and individual members of the public. 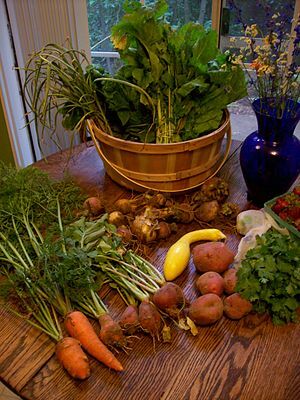 In the winter, members purchase “shares” in the farms future bounty and pay anywhere from $400-$500 up-front. This fee gives the farmer funds to purchase seeds, upgrade equipment and get ready for the busy season. Once the farm is producing, each member receives a weekly box or other amount of whatever is harvested that week and this goes on throughout the growing season. The benefits to the farmer are great–he or she knows has money to invest in the farm upfront and has a ready-made customer base (although members don’t pay for the weekly boxes, there are usually opportunities to purchase other items). The benefits to members include a steady supply of fresh fruits and vegetables and having a connection to a community farm. If you want all-organic produce, you can work specifically with an organic farmer. This all works really well unless the weather is bad or there is a blight and farm production is reduced. In that case, it is a good learning experience about the gamble of farming. Modified CSAs are membership clubs that work with a select group of farmers, rather than just one and they tend to offer a greater variety of products. Like traditional CSAs, there is usually some up-front or membership fee and after that, they vary widely. Some provide one standard box of produce each week, others give members varying degrees of choice in what is in their box. Benefits to the farms are the same as a traditional CSA, and include also that the farmer does not have to run a separate business. Benefits to members include a wider variety of produce and a small safety net in case one farmer has trouble producing. Who are the farmers? Where are their farms located? Can I visit the farms? How can I contact the farmer? How are farmers chosen for participation? How sustainable are the farms in the group? What are their farming protocols? How much of the membership fees/payments are used for overhead (management, marketing)? Can I see the most recent annual financial statement? If all fees are paid in advance, how are these funds managed? Is there a board or is this an individual? Who has authorization to spend the funds and how is the risk of fraud addressed? I know that last question sounds harsh and it might be hard to ask, but some modified CSAs charge an annual fee of up to $500. That’s a lot of money for a family and if the farmer isn’t in charge of the money, you need to know who is. Just sayin’. The farmer’s market is still a great way to get the widest variety of locally produced vegetables quickly after harvest. 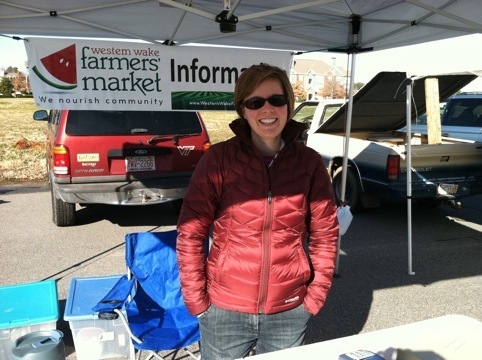 Farmer’s markets are springing up everywhere these days, which is great for consumers. 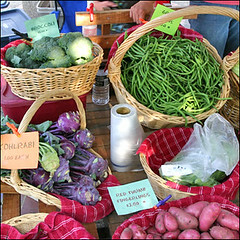 To find a farmer’s market in your area you can go to www.sustainabletable.org and search by zip code. Benefits to farmers include one-stop delivery of their products and a direct connection with customers. The downside to farmers is that farmer’s markets are a lot of work and their customer base is heavily dependent on the weather that day. Benefits to consumers include the ability to price shop among vendors, ask questions to the farmers themselves (or their family members), and see the amazing variety of seasonal products available in your area. Farmer’s market caveat: make sure the market where you shop requires vendors to a) grow the food themselves and b) farm within 100 miles or less of your market. This prevents commercial food vendors from selling you the same veggies they are delivering to the supermarket, which often come from another state or country. Ok, this probably should have been first on the list. Growing your own vegetables or fruits is an incredibly fulfilling task. From my experience, I can say that walking out to your own backyard and picking vegetables for dinner is tremendously satisfying. You can’t get any fresher or more local than that! With a sunny patch and a little know-how, you can produce wonderful results for your family. The only downside to growing your own vegetables is that if you aren’t successful, you pay for the seeds/plants and still end up buying vegetables elsewhere. That’s where I am and why we joined the flexible CSA. No matter what your resources, there are options for fresh vegetables coming soon! How will YOU get your veggies this year?